Last week, Autodesk released the Inventor 2017 R2 update which includes productivity enhancements voted on by Inventor users worldwide. Over 40 enhancements have been made in sketching, part and assembly modeling, design automation, drawings, interoperability, and presentations to help you get your work done faster and make great products. Today, I’ll show you some of my favorites. Part/Assembly/Flat pattern sketches now maintain the properties specified in the Geometry Properties dialog box (for example, line type, scale, line color, and line weight) when exported as an AutoCAD DWG file. 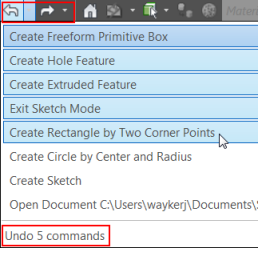 You can elect to display or not display the mini-toolbars when you access one of the following commands: Extrude, Revolve, Fillet, Shell, Face Draft, Chamfer, and Joint. These dialog boxes have a mini-toolbar that displays alongside of the dialog box. The available options on these mini-toolbars are the same as the dialog box options. To maximize the amount of graphical space, use the new View panel > User Interface panel > Mini-Toolbar command to turn off the display of these mini-toolbars. You can now easily jump back and forth to a different point in time. Your undo/redo history now displays in the new Undo/Redo drop-down menus. Click a drop-down arrow and select from a list of actions you want to undue or redo. Some of these changes you’re seeing here were actually thought up by users like you and implemented by the Autodesk Product Development team. So If you have ideas as to how to improve the program we want to hear !! You can post your ideas to the Autodesk Inventor Ideastation page and who knows you might just see your implemented in a future update. For the link click here. With the left mouse button, double-click a face or an edge. Select one or more faces or one or more edges, right-click, and select Select Tangencies from the context menu. Note: Hold down the CTRL key to select more than one face or edge. Example selecting tangent faces: Right-click a face, select Select Tangencies OR with the left mouse button, double-click a face. Result: All tangent faces are selected. Delete the selection set with Delete Faces. Assign an appearance to the selection set. Add or remove thickness to faces, or create an offset surface from a part face with the Thicken/Offset command. Fillet or chamfer the preselected edges. Review or check for tangency conditions or closed loops. You can now select an excel template file (.xlsm) with macros when exporting. Macros are maintained in the exported excel file. You can now export Revision Tables and Parts Lists to an excel macro-enabled file (.xlsm). The following excel file types are now supported from a Parts List or Revision table for export: *.xltm;*.xlsx;*.xlsm;*.xlt;*.xls excel templates. You can now reorder attached balloons by their value. First, attach balloons using the Attach Balloon From List context menu option. 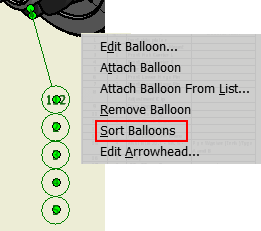 Then, after closing the Attach Balloon dialog box, right-click on the balloon stack and select Sort Balloons. Values are automatically reordered. Numeric attached balloons are reordered from smallest to largest. Alpha attached balloons are reordered from A to Z. If you are interested in learning more about these changes, be sure to visit the Autodesk page for yourself where you’ll get a complete rundown of all the changes implemented. View our instructional blog post for a step-by-step process on Downloading the Inventor 2017 R2 Update. Bryce, these are good features. How does a 2017 user get the R2 update? Users can download the Inventor 2017 R2 update by simply signing into the Autodesk Desktop App with your Autodesk Account login and looking under Inventor for most recent updates.